ECO CARE is the driving force for "affordable quality" in the Mahoning Valley. We believe in quality work for a fair price. There has been a stipulation for too long that you should have to pay extra for good service or quality work; well we think that’s just plain senseless! With ECO CARE, you’ll always get quality work for a fair price, and let’s be honest, that’s exactly what you want isn’t it? Ask any of our many satisfied clients, and they’ll all tell you that our dedicated staff is both friendly and reliable. They’ll tell you in every case, our work has met or exceeded their expectations, guaranteed! Our reputation is important to us, ECO CARE has grown primarily through repeat business and word of mouth, and we wouldn’t have it any other way. Commercial clients are our largest accounts, and it is through them that many thousands of people see our detailed work every day. In order to both meet and exceed our client’s dynamic needs, we are continuously evaluating everything we do from processes to equipment. ECO CARE maintains many different types of commercial accounts from condominiums, shopping centers, office buildings, industrial parks, camp resorts and restaurants. We are equipped to handle larger properties, as well as the smaller ones. Each company gets our full attention as if they were our only client. Now that’s the attention you deserve, the grass really is greener on the ECO CARE side! 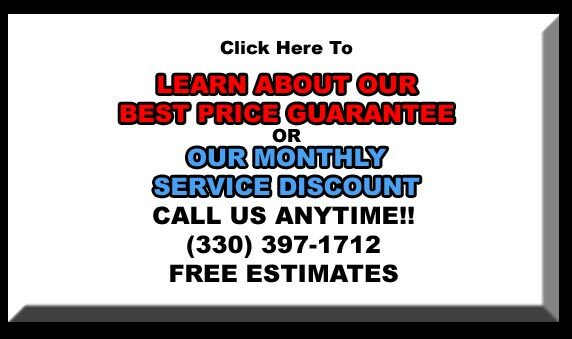 And as always, not only do you get our exceptional quality service, but it’s backed by our Best Price Guarantee. And as always, when you use ECO CARE you know you’re getting 100% quality service for a fair price. Snow Removal & Ice Management is a necessity for every business in Northeast Ohio, and our clients both expect and deserve the very best service. At ECO CARE, we understand that quality, dependability and affordability are the most important factors when choosing a service company, and we’ve built our business on those ideals. ECO CARE provides commercial Snow Removal & Ice Management solutions to some of the larger properties around the Mahoning Valley. We use state of the art commercial equipment on each job providing us maximum efficiency. And it’s because of our high efficiency, that we can offer prices that are unrivaled in our area. Most importantly, we care what you think. Our reputation is important to us, which is why we guarantee your satisfaction on every job. Residential services are among our favorite because we get to meet so many wonderful people. But it’s because of those people that we have been able to grow into the company we are today. Our reputation means so very much to us, which is why we ALWAYS go the extra mile to make EVERY client happy. When you use ECO CARE, you’re getting friendly reliable people that really care. What’s the first thing people see when driving by your house? Better yet, you live there; what do you see? We know that 8/10 people are unhappy with their yard’s appearance, but most people are not aware of how reasonable lawn care & landscaping services can be. Landscaping takes many forms, but none more basic than mowing. For most people, lawn mowing is a chore, and their yard ends up looking as good as they feel after cutting the grass. And since most residential grade lawn mowers only do an average job on cutting grass, you never achieve that professional look and feel you hoped for all along. With ECO CARE your mowing problems are gone, and that gives you more time to spend your weekends how you want, not landscaping. 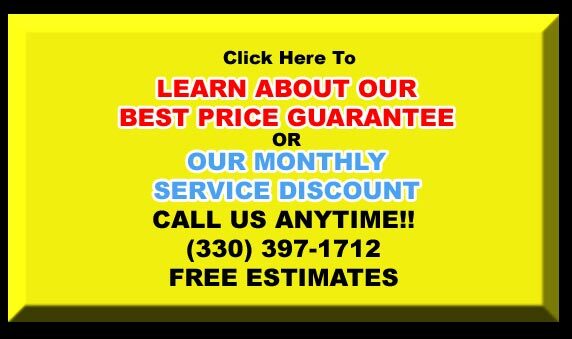 Let us take care of your grass cutting needs. Our commercial grade equipment gives you that professional look all year long. Trimming, it sounds so easy doesn’t it? That is until you actually get out there and start hacking away at hundreds or sometimes thousands of dollars of shrubbery. Tree trimming, shrub trimming, trimming bushes, trimming trees, and let’s not forget pruning. And after that’s all said and done, it’s clean-up and disposal time! Trimming can become overwhelming for most of us, but there is an easy solution to all your landscaping needs, it’s ECO CARE! At ECO CARE, we take pride in knowing that you’re 100% satisfied with the look of your yard. 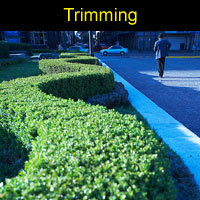 Trimming & pruning is affordable, and you know you’re getting quality service every time. One of the keys to having a beautiful yard is to feed your grass the nutrients it needs to grow thick and healthy. Thick, healthy grass is much more likely to prevent unwanted diseases, molds and pests from invading your yard. 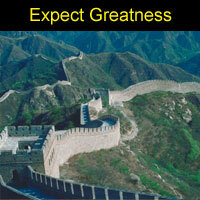 A little preemptive planning will save you a lot of grief and money. 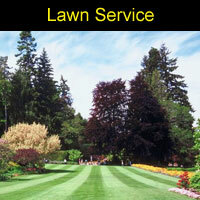 One of the most important aspects of our lawn services is fertilization. 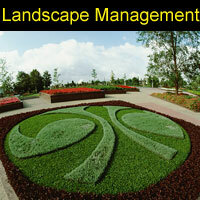 Fertilizer comes in different forms, and in most forms is really not that difficult to apply. As you know, you can buy fertilizer in a retail store right now that will keep your lawn thick and healthy. What you may not know is that trained and licensed fertilization professionals from ECO CARE can do all the work for you for about the same cost you’ll pay for fertilizer and equipment. 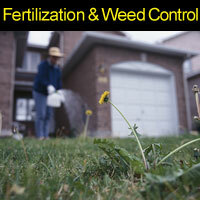 As you may have guessed, we do organic fertilizer treatments as well as chemical fertilizing. In many cases, organic fertilizer can achieve the same success as fertilizing with chemicals and can be very cost effective as well. If you already have an issue with disease, mold or other pests in your yard, it is imperative that you call a professional immediately. These unwanted visitors can be very tricky to diagnose and often just as tricky to get rid of. 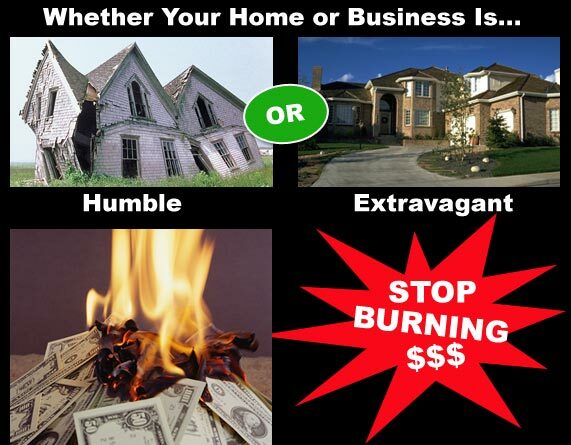 Unfortunately, we see this all too often where home owners end up spending valuable time and money without achieving the desired results, only to end up calling a professional. Not only will we save you that unwanted stress, but we will save you $$$, and that’s important. And by using ECO CARE’s lawn service, you know you’re getting the best service at an affordable price guaranteed. Landscape beds can drastically enhance the appearance of any home, and there are an abundance of affordable options to choose from. If you’re looking for a new landscape bed, our professional design team will help you plan the perfect landscape design for any setting. 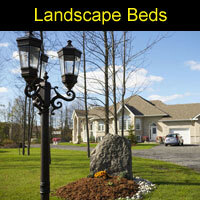 Or if you’re looking to enhance an existing landscape bed, we can give new life to any outdated area you desire. Remember, landscape beds aren’t just about what color mulch or stone to use, they are an expression of who you are and it’s through them that you can truly achieve serenity in your private sanctuary. That’s why we take great pride in helping our clients achieve the perfect design while creating the precise atmosphere. 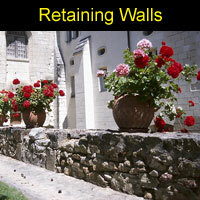 A retaining wall can be a beautiful and inexpensive addition to any home. Retaining walls can serve many functions such as creating beautiful raised planting areas or to separate areas of the landscape, but the most basic function of a retaining wall is to hold back existing soil, while bringing new beauty to the area. Whatever function you desire, a new retaining wall can significantly enhance the splendor and value of your home. And as always by using ECO CARE for all your landscaping needs, you know you’re getting quality work for an affordable price, guaranteed! Adding a walkway can be an amazing transformation process to any yard. It can single handedly bring new life to a once barren landscape. Walkways come in various forms such as brick walkways, flagstone walkways, concrete walkways or walkway stones. Of these different types of walkways there are many variations and color schemes available for your new walkway. Whether you have a solid foundation of how you want your landscape to look, or need a few landscaping ideas from a professional landscape designer, ECO CARE can guide you through this incredible landscape revolution. 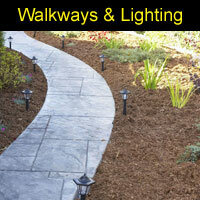 Landscape lighting is an excellent addition to any walkway or landscape feature. In fact, outdoor lighting is one the most important aspects you can add to your landscape. Outdoor lighting is wonderful for accentuating a beautiful landscape. Your features will glow brilliantly at night for all to enjoy. But most importantly, outdoor lighting is one of the cheapest and yet most effective measures you can take to deter break-ins after dark. And ensuring your family’s safety at night is by far the best addition you can make as a home owner. Whether you’re looking for garden lights, deck lighting, patio lighting or solar lighting, ECO CARE is a reliable solution you can afford guaranteed. Out with the old, in with the new! If you’re tired of that old look and feel of your home, there are a lot of affordable options for you to choose, and they’ll all make you feel better about your home. Peaceful living is something we all strive for. Unfortunately most of us get caught up in life’s stressors, and never achieve that peaceful easy feeling. If you’re looking for a new feel or a relaxing atmosphere, ECO CARE can help. We’ll transform any space into your own sanctuary to help you unwind after a long day, guaranteed. Flowers can be brilliant and beautiful, their petals radiate sunlight in all directions and can open your yard like a window to the outside. 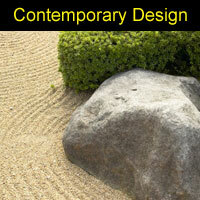 They will bring life to even the most boring landscape, and are often used to add structure, stability and contrast. 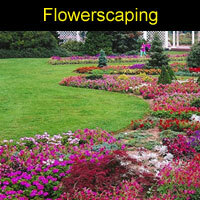 Flowerscaping is a refined art that combines formal landscaping with horticulture. It takes many shapes and colors in all types of landscapes. So whatever look or feel you are wishing to achieve, ECO CARE has both the knowledge and the vision to guide your yard transformation. 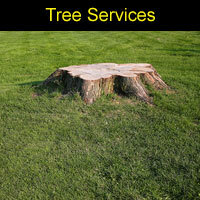 Whatever your needs are, ECO CARE offers fast and reliable tree service. Our expert tree service team performs many affordable tree services from tree pruning, tree trimming, fighting tree disease, problematic tree roots, tree removal, stump removal and general tree care. 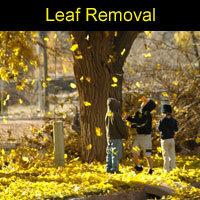 Tree Removal and Stump Removal is something that many home owners need at some point in time. Sometimes you need our services for aesthetic purposes; other times you are seeking emergency tree removal. Whatever the occasion, the friendly and reliable people at ECO CARE will solve your dilemma in quickly and affordably, guaranteed! Wasn’t fall time so much fun as a kid, building big piles of leaves just to jump in; where did the good old days go? Now you’re out there breaking your back on your day off just so more leaves can fall down next week and you can start all over. Did you know the average homeowner will amass 40 bags of leaves in one year, why put yourself through all that? Don’t waste your time or your money. If you need a clean-up crew or just need hauling services, ECO CARE will pick it up and get it out of your way forever. 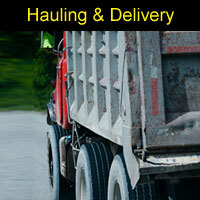 We take any materials and dispose of them properly, call us anytime for a free estimate. Many people are do-it-them-selfers, and that’s great! We provide delivery services to anyone in need of raw materials, we deliver anything from plants and trees to mulch, stone, lumber and top soil. No job is too big for ECO CARE. 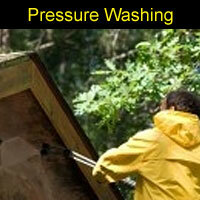 Pressure Washing is one of the simplest and most affordable ways for ECO CARE to makeover your home. If your home appears dull and dirty, or is showing signs of mildew or fungus, ECO CARE’S Pressure Washing Service will definitely provide an energizing facelift to any surface. 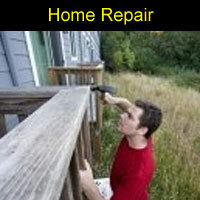 We also specialize in deck restoration. We’ll clean, strip and re-apply stain or sealant to transform your deck or patio back to that just built look. So if your deck or patio has that old and faded look, call ECO CARE for a free estimate, and get back to enjoying your new property all over again! Clogged gutters cause all kinds of grief for a homeowner each year, from foundation problems to leaky roofs caused by rotting wood to icy driveways and steps. Gutter guards, provide a virtually fail proof barrier against debris that will cause permanent damage to your home. ECO CARE installs gutter guards on homes each year, so don’t wait till it’s too late. 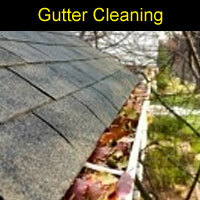 Gutter Cleaning is the affordable alternative to installing gutter guards. ECO CARE will make sure you never have to get on that ladder to clean them out again! Home Repair can be a necessity at times, and if you’re not handy with a hammer , it could end up costing you a lot of extra $$$. At ECO CARE, we’ve built our business on quality service for a fair price. We’ve helped out a lot of nice folks along the way, who’ve in turn helped us out by giving us such a good reputation as friendly, reliable and great at what we do. So if you need a helping hand, ECO CARE is by your side, and we’ll bring the tools! Tired of locking your dog up in that ivory tower because they won’t stay on your property? Invisible Dog Fence is your best solution, its effective up to 99.5% , and through ECO CARE, it’s very affordable. 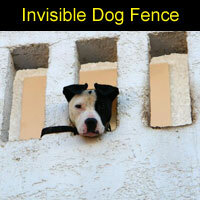 Invisible Dog Fence Installation is easy and effective. Your new protection barrier will be installed quickly by one of our installation professionals with virtually no signs of installation. 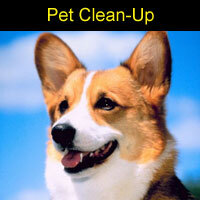 We’ll customize a protection plan based on your pet’s needs to ensure the best quality results. And as always, when you use ECO CARE, you know you’re getting quality service for a fair price! This is abbey, she is ECO CARE’s best friend, unfortunately she hasn’t learned to flush yet, but we’re not holding our breath. Cleaning up after your pet can be a traumatic experience, dog waste on a shoe, in the house, on the carpet, and oh that smell, no thank you! That’s why ECO CARE takes care of all that for you, and you’ll never have to get near it again. Pet waste removal is so affordable, you’ll wonder why you didn’t sign up sooner. Remember as a kid waking up on a school day hoping school was cancelled so you could go sled riding, build snow men and have snowball fights? Well things have changed, a lot! Now you have to get up early to shovel snow just so you can get out of your driveway to go to work, doesn’t seem right does it? People like you all over The Mahoning Valley use ECO CARE to guarantee their driveway & walkways are clear every day. 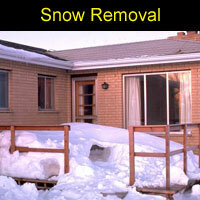 We pre-arrange snow removal service and accept on occasion callers who just need snow removal one time. 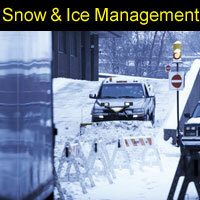 Our snow removal service is fast and affordable, guaranteed. Ice Removal is the key to safe walkways, at ECO CARE; we have options for you that are pavement friendly and cost effective, so call ECO CARE for all your snow plowing and ice removal needs. For most folks, Christmas decorations play a vital role in building that much needed holiday spirit. Unfortunately set-up can be a nightmare for most folks, let alone the health risks of getting on a ladder that time of year. 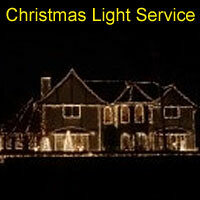 ECO CARE helps families out every year by providing Christmas light service. There are many affordable options to choose from, and we can accommodate any size property.